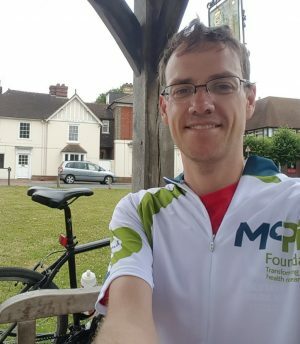 Our policy manager Ian writes about why he is doing RideLondon, and the special challenges of doing it whilst in recovery from anorexia. That was my Mum’s response to the news that I am doing RideLondon 100 mile bike ride at the end of July. Well yes, I suppose I am ‘mad’. That’s why I chose to ride for the McPin Foundation and mental health research. When I was first diagnosed with anorexia in 2013 like many people my first instinct was to try and get my hands on as much information as I could. There wasn’t a lot. Or at least a lot that was underpinned by hard evidence. There was even less that chimed with my own experiences. Not just as a man with a “women’s” condition, but simply as a human being with all the complexity that entails before you layer a couple of mental health problems on top. Reading research papers I saw myself reduced to numbers, symptoms and abstract concepts. This reflected my experiences in recovery. For most of the people around me, even the professionals, their focus was on the tangible. The hard numbers they could measure. My weight. My blood chemistry. What I was eating. Understanding the psychological distress that was the ultimate cause often seemed secondary. The experience of feeling like just a number was one reason I was excited to come and work for McPin last year. I was inspired by the vision of putting the people affected by mental health problems at the heart of research. People like me. People like me who want hope that the future will be better. The hope that only high quality research that addresses the problems that matter to us, not academics, can deliver. Working at McPin has been an important part of my personal recovery. As I move on at the end of July I’m keen for more people to have the opportunity I’ve had. That’s why I wanted to raise money to help McPin create more opportunities and carry out more potentially life-saving research. 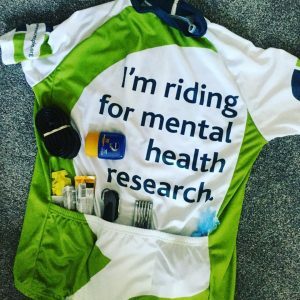 So why did I chose to do RideLondon and why is it such a personal challenge? Like many people with an eating disorder I have a complicated relationship with exercise. We all know that being physically active usually improves people’s mental well-being. ‘Body’ is the first segment of the “Wheel of Wellbeing”. Evan wrote powerfully for us last year about how cycling had helped him manage his depression. Physical activity has been a refuge for me at times too. Hill walking, running and cycling are all ways I have calmed the storms in my mind. But the anorexic part of my mind turned exercise into an obsession. Long runs became a way to lose weight and to atone for eating, no matter if I was already severely underweight. The pain and suffering of training for a marathon was a socially acceptable, even celebrated, form of self-harm. I twisted every leaflet, social media post, and well-meaning friend that suggested a bit of physical activity would help my mood into an accusation that I was lazy and not exercising enough. So a couple of years on the challenge of training to ride 100 miles has been more mental than physical. Managing the changes in my diet necessary to fuel my long rides despite the voice in my head that already castigates me for eating too much. Letting myself stop or have a rest day when I’m exhausted or injured, rather than pushing on through the pain as the perfectionist in me demands. Getting to the position where I am (touch wood) able to complete RideLondon without reawakening my anorexic demons has been a milestone in my recovery. Exercise is now returning to being a sanctuary for me. A way to boost, not harm, my wellbeing. I’ve still got to actually get around the 100 miles and over the hills. When I’m struggling up Box Hill I hope that the thought of the money I am raising to support mental health research may keep the pedals turning. If you would like to support Ian you can here. If you are interested in riding for McPin in next year’s RideLondon please get in touch.